The prevalence of Epilepsy in the general dog population has been estimated at .5 to 5.7%. There are two main types of Epilepsy, Primary and Secondary. Primary Epilepsy can be genetic or it can be idiopathic, which means that there is no identifiable underlying cause. The three most important factors in the diagnosis of idiopathic epilepsy are 1) the age of the dog at the disease's onset, 2) the type of seizures, and 3) their frequency. Secondary Epilepsy can begin due to a number of different causes. Seizures may be caused by trauma, a toxin, a brain tumor, an infection, or an issue with your dog’s blood, kidneys, or other organs. Born in mid August 2005, we brought Bailey home in the beginning of October. 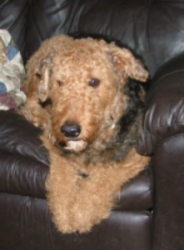 He was a normal Airedale Terrier for the first 4 1/2 years. Just like when you have children, there is no guarantee that your puppy will be born perfectly healthy or stay healthy forever. That was the case with our dog, Bailey. Idiopathic Epilepsy generally begins when a dog is between the ages of 6 months and 5 years. Bailey's seizures started in March of 2012 when he was 4 1/2 years old. Although there are several different types of seizures, probably the scariest is the Grand Mal. Before a dog has a Grand Mal seizure, he may show a significant change in behavior, followed by a physical manifestation. Signs include restlessness, nervousness, whining, trembling, salivation, affection, wandering, hiding, hysterical running, and apprehension. Of course. take note that many of these signs may also be normal behavior for your dog. The most important part of helping your dog through a seizure is that you stay calm from beginning to end. During a Grand Mal seizure, your dog will fall to his side and begin convulsing. The scary thing with Bailey's seizures is that he usually rears up on his hind feet and falls over backwards. When Bailey has a seizure, we make sure that anything harmful, such as any sharp or heavy objects are pushed out of the way. At the onset of a seizure, Bailey usually vomits. I know that's gross, but it's important to note the first signs of seizure in your pet. We have only moments to make the area safe for Bailey before he collapses and begins convulsing. The convulsive stage of the Grand Mal seizure is called the ictus. Some suggest covering your dog with a blanket, but we never do because Bailey doesn't like to be covered. We stay near him and talk to him quietly using phrases like, "Stay with me, boy" and "Come back to us Bailey". Truly, I don't know if it helps him much, but it makes us feel better, calmer, and more in control of this out-of-control situation. All told, it is important that you stay calm for your dog. Some sites also suggest that you can pet your dog during the ictus. For instance, there is a YouTube video where the dog's owner says she massages her dog through the seizure. Again, this is something we never do because of the convulsions, salivation, and teeth gnashing. Unfortunately, we can't know what, if anything, goes through the mind of a seizing dog and, aside from the danger of possible accidental bites, we feel it's best to keep his stress level as low as possible. We have been very fortunate in that Bailey's Grand Mal seizures have been from only 35 seconds to 90 seconds long, (Even though each seizure feels as if it is the longest period of our lives!) Our vet gave us a vial of Valium to use if they should ever last longer than five minutes. Luckily, that hasn't happened yet. Bailey's seizures are also less frequent than those of many other dogs. They have ranged from two weeks to two months apart. So far, he has had less than two dozen since they started back in 2012. After the ictus has passed, your dog will probably experience the post ictus. He may be disoriented, temporarily blind, seemingly compulsive, nervous, overly hungry or overly thirsty. This is the time when you can be the most helpful to your dog. Keep him as quiet as possible. Keep talking to him in a calm, reassuring voice. If you think he will trust you to pet him, do so. Bailey is usually temporarily blind for a couple of minutes during the post ictus, so we start petting him low on his back to keep our hands out of danger in case he should be startled by our touch. Full recovery from a Grand Mal seizure can be as short as 30 seconds or take as long as 24 hours. Bailey's recovery usually is within minutes of the end of the convulsions. Often he becomes very playful shortly after he regains his feet. Tonic-clinic: The tonic phase is the true onset of a Grand Mal seizure where the animal first falls and stiffens his limbs. The clonic part is the actual convulsion and may include behaviors like paddling his limbs, salivating, gnashing his teeth, and loss of control over his bowels. Psycho motor (Behavioral) Seizures: Behaviors your dog may exhibit during a Psycho motor seizure can include: lip-smacking, chewing, fly biting, aggression, vocalization, hysterical running, cowering or hiding in otherwise normal situations. Needless to say, unlike a Grand Mal seizure, your dog won't lose consciousness during a Psycho motor seizure. We have noticed hysterical running, cowering, fly-biting, and lip-smacking in Bailey from time to time. These may or may not be signs of a secondary form of epilepsy. While some of these behaviors can be caused by other stimulus, it's important to note the frequency and duration of the behaviors as possible epileptic factors. Cluster Seizures: Multiple seizures with only short periods of consciousness in between are Cluster Seizures. Although they are not Status Epilepticus, they can devolve into this most serious type of epilepsy. Moreover, both Cluster Seizures and Status Epilepticus are life-threatening and warrant immediate medical attention. Status Epilepticus: A seizure that lasts for 30 minutes or more, or a series of multiple seizures in a short time with no return to normal consciousness is called Status Epileptics. We keep a log of Bailey's seizures to track their duration, frequency, and any change in events.